Practice Separation Processes questions and answers for interviews, campus placements, online tests, aptitude tests, quizzes and competitive exams. This set of Separation Processes Multiple Choice Questions & Answers (MCQs) focuses on “Dialysis”. 1. What does haemodialysis removes other than harmful wastes? Explanation: Hemodialysis uses a machine to clean and filter your blood. The procedure also helps control blood pressure. And it helps your body keep the proper balance of chemicals like potassium, sodium, calcium, and bicarbonate, the NIDDK says. 2. Which part acts as a kidney in dialysis? Explanation: A dialyzer acts as a kidney in dialysis which purifies the blood. 3. How many times a week dialysis must be done? Explanation: Dialysis is carried out thrice a week and it lasts for three hours. 4. Where is haemodialysis carried out? Explanation: Hemodialysis cannot be carried out at home. 5. What can be a side effect of haemodialysis? Explanation: Cramps, weakness and nausea are a side effect of hemodialysis. 6. Which mineral must be consumed limitedly for a person undergoing dialysis? Explanation: Potassium levels can rise during dialysis treatment.Hence the intake of this mineral must be limited. 7. Which of the following is a problem of peritoneal dialysis? Explanation: If the catheter entering the body becomes infectious, then it can cause abdominal infection. 8. What is the difference between diet for peritoneal dialysis and haemodialysis? Explanation: The diet for peritoneal dialysis requires more proteins. 9. What is the correct definition for dialysis? Explanation: When there is a failure of kidneys, dialysis is done where it removes waste from the body. Explanation: The space around the gut is called peritoneal cavity. 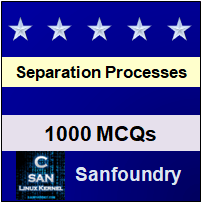 Sanfoundry Global Education & Learning Series – Separation Processes. To practice all areas of Separation Processes, here is complete set of 1000+ Multiple Choice Questions and Answers.